Synopsis: When legions of monstrous creatures, known as Kaiju, started rising from the sea, a war began that would take millions of lives and consume humanity’s resources for years on end. To combat the giant Kaiju, a special type of weapon was devised: massive robots, called Jaegers, which are controlled simultaneously by two pilots whose minds are synched via a neural bridge, called “The Drift.” But as the enemy grows more powerful with each attack, even the Jaegers are proving nearly defenseless in the face of the relentless Kaiju. 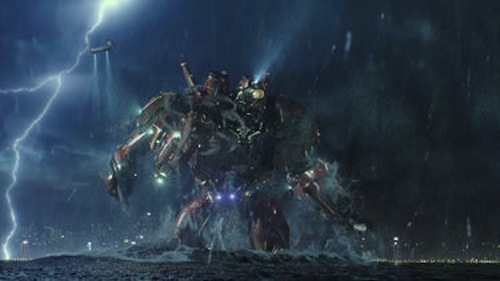 On the verge of defeat, the forces defending mankind have no choice but to turn to two unlikely heroes-a washed up former pilot (Charlie Hunnam) and an untested trainee (Rinko Kikuchi)-who are teamed to drive a seemingly obsolete Jaeger. Together, they stand as mankind’s last hope against the mounting apocalypse. It’s hard to imagine that moviegoers will get much more for their buck than Legendary Pictures and Warner Bros. Pacific Rim. The film is a 14-year old boy’s backyard play session brought to life on a grand scale and with high quality special effects. At the same time, Pacific Rim is a story with thinly veiled plot motivations and very one-note characters. However, if you can look past those minor missteps, you’ll find one of this year’s best action movies. 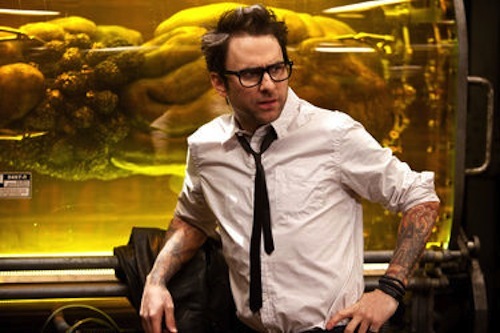 In a lot of ways, Pacific Rim is the culmination of director Guillermo del Toro’s life’s work. His penchant for rich cinematic universes, wildly detailed creatures and sets, and inventive set pieces are each well represented in the film, and taken to a degree only a summer budget could accommodate. 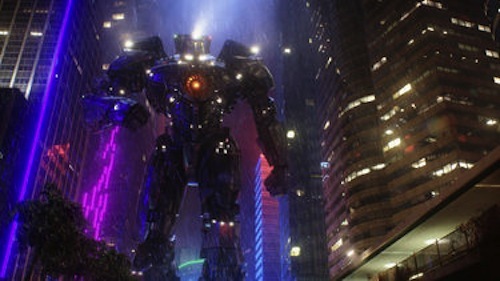 Take for example the film’s massive robots, which are called Jaegers. Each is more creative than the next. The Jaeger the audience will most connect with, Gipsy Danger, has a familiar design, but it, along with all the Jaegers, functions in a way that feels natural to this world. You can tell that del Toro put a lot of thought and care into each of the Jaegers, even the ones that are on screen for less than a minute. The same can be said about the giant, building-size monsters in the film, called Kaiju. Each has a call sign like the Jaegers and each has its own personality. Perhaps the best compliment that can be raised in regards to the Kaiju is that not a single one looks or feels like Godzilla. Even more impressive is the fact that it’s hard to tell which element received more attention, the Jaegers or the Kaiju, but anytime either is on screen the action sizzles. Unfortunately, those glowing compliments cannot be attributed to the film’s human contingent, which is a mixed bag at best. While side characters like Idris Elba’s scenery-chewing, war-hardened leader Stacker Pentecost (great name, by the way) and Charlie Day’s eccentric, Kaiju-obsessed Dr. Newton Geiszler do well in their roles, the film’s lead, Charlie Hunnam, lacks any of the gravitas necessary of a film like this. As Raleigh Becket, the once promising Jaeger pilot, Hunnam has more in common with the robots than any of the human actors – his delivery is cold and emotionless. In Hunnam’s defense, most of the characters in Pacific Rim are drawn with such broad strokes that you almost, for a second, don’t mind the rote delivery. But, when other actors are approaching the silliness of it all head-on, you start to wonder if he was the only one that didn’t get the memo. That’s the true crux of it all: Pacific Rim is in on its own absurdity. It buys into the concept of giant robots fighting giant monsters wholesale, and doesn’t skimp on any level of that experience. Of course, that means the story has a few formulaic story beats and character arcs, but my guess is that was part of a collective bargaining agreement between the studios and the filmmakers. Pacific Rim is an original film told by one of our generation’s most exciting filmmakers, but one who hasn’t had a tremendous amount of success over his career. Del Toro has talent, there’s no denying it, but getting that talent out to the masses must have required some delicate maneuvering, and some very careful script editing. In order to make a film where the focus is giant robots and not some bankable star, del Toro and fellow screenwriter Travis Beachum likely had to make some concessions on the story front. Of course, they tailored those edits to their liking, but there’s still something innately generic as far as the script and characters are concerned. Luckily, once those one-note characters hop into the Jaegers, and the steel fists meet Kaiju skull, none of that matters. Because the sheer joy that comes from watching massive creatures – creatures designed by Guillermo del Toro no less – beat the ever-living crap out of each other is as satisfying for the 14-year-old boys as it is for everyone else. Yes, the story is pretty generic, but Travis Beachum and Guillermo del Toro deserve a tremendous amount of praise for the world they have created. Pacific Rim’s script should be included in a world-building 101 class when it comes to sci-fi or fantasy. For example, the concept of “the drift,” the psychic link that connects two Jaeger pilots. This could easily be a simple one-sentence explanation in the film, but the script roots the concept in such a way that it makes complete sense. You believe that the drift is the only way to pilot a Jaeger and the idea of two people sharing thoughts and memories eventually informs some of the film’s plot. There’s a lot to take in as far as story set-up is concerned, but the fact that I could explain it all is a testament to the script. A giant robot fighting giant monster movie is, as you might expect, only as good as the design of its robots and monsters. And I’m happy to report both the Kaiju and Jaegers look great in the film. There’s a personality to both that makes each one stand out from the next, and more importantly makes them a delight to watch battle on screen. And surprisingly, the Kaiju and Jaegers are designed with functionality in mind, not simply to sell toys. Sure, each has its special flourish, but I never felt like I was trying to be sold on anything but the Pacific Rim universe, and boy what a great universe it is. While there’s a time and a place for squeaky-clean production design, Pacific Rim succeeds in large part because the world feels lived in. Every element feels like it was designed with second-level thinking. First, to create the general look of the Kaiju, Jaegers, cities, buildings, etc., and then to age it to the point that it looks distressed, lived in, cobbled together from every scrap of building material left available, and remnants of the Kaiji have also become part of the landscape. In a year when action sequences have been pushed to the next level, Pacific Rim can certainly hold its own. There’s a scope and a scale to the action sequences that makes you believe every moment. Audiences will cheer often during the action, and they’ll come away having experienced something very unique. That being said, Pacific Rim‘s action is a little inconsistent in that it spreads the sequences a little too thin over the film’s 2+ hour run time. There are really only three key action sequences in the film, and while they are fantastic there’s a definite lull in the middle, which is bogged down by some really obvious exposition. It’s also occasionally difficult to make out the action amongst the effects, but that could be a byproduct of the 3D post conversion so I wouldn’t hold that against the film too much. 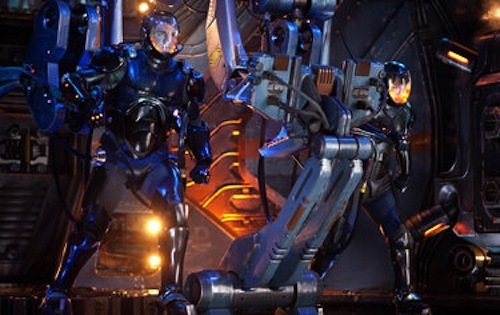 Pacific Rim gets its action shots, and makes sure they leave the audience’s jaws on the floor.